"Quick and easy appetizer! 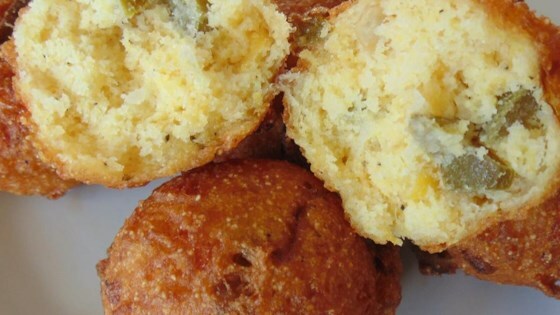 Similar to a Southern hush puppies but made with delicious real crab meat! This is really good served with a hot cheese dip or with tarter and cocktail sauce. My husband will stand by waiting for them to finish cooking to eat them right away." Mix self-rising flour, cornmeal, garlic salt, pepper, corn, crabmeat, onion, and eggs together in a bowl; let sit for 10 minutes. Heat oil in a deep-fryer or large saucepan to 365 degrees F (185 degrees C). Drop 6 to 8 tablespoon-sized balls of batter into the hot oil; fry until golden brown, 4 to 5 minutes. Remove hush puppies with a slotted spoon and drain on paper towel-lined plate. Repeat with remaining batter.